Alfred was born in Howden Clough in 1893 the son of Isaac Midgely Ineson and his wife Ruth (nee Asquith) who came from Batley Carr. They had married at the Wesleyan Chapel, Birstall in November 1873. His siblings were James Swales (1878), William (1886), and Millicent (1889). In 1891 the family was living at 33, Turner’s Buildings, Howden Clough, moving before 1901 to 54, Leeds Road, Birstall where Isaac says he was a cloth fuller, James Swales was a pupil teacher, William was a cloth cutter whilst Millicent and Alfred were at school. By 1911 Isaac, Ruth, Millicent and Alfred had moved to a five roomed home at Howley Low Mill. Alfred was an assistant cloth fuller, Millicent was a dress maker and Isaac was a cloth fuller. The couple had lost two of their 6 children during their 37 years of marriage. At the time of the sinking of the ‘Britannic’ in 1916 the Batley Reporter said his fiancée was Miss Luty of Batley. After his discharge from the army he married Florence Annie Dawson in 1918 at Stamford, Lincolnshire and she came to live at Ailsa Dell, Benny Parr Woods, Batley. In his will, Alfred left £93.9s.10d to his wife Florence Annie Ineson. His nephew James died in May 1944 as a result of war service in World War 2. Alfred signed his Attestation papers on 11th January 1915 at York giving his address as Benny Parr Woods, and that he was a cloth fuller. He stated that he was 21 years old, and 5 feet 6 inches tall. 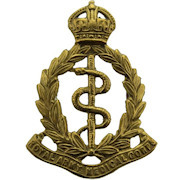 His records show that he was serving on home shores from 11th January to the 13th May 1915, but during that time on the 27th April he had passed his Nursing Class for the R.A.M.C. He joined the British Expeditionary Force on the 14th May 1915 and was wounded in action on the 20th July 1916 but this could not have been serious because he was sent home on the 24th July for 61 days, joining His Majesty’s Hospital Ship ‘Brittanic’ on 24th September 1916. However he did spend from 24th July until 2nd August being treated for slight injuries to the head and chest at the Lord Derby War Hospital, Warrington. Alfred joined the H.S. Britannic on 24th September 1916 but whilst she was sailing in the Aegean Sea in the Kea Channel on the morning of Tuesday, 21st November 1916 she was shaken by an explosion, caused by an underwater mine, U-73 laid by Lt. Cdr Siehs, and sank 55 minutes later at 9.07 a.m., killing 30 people. The ship lowered all the 35 boats. Thirty to forty of the crew were injured. Nurses in common with the officers and men of the R.A.M.C. lined up on deck and there was no panic. The women behaved coolly. One of the stewardesses, Violet Jessop, was on board the ill fated Titanic and also had been on board the Olympic during her collision with HMS Hawke. In describing the present disaster she said two loaded boats were sucked towards the sinking vessel as she keeled over with her screw whirling in the air, and these were smashed like matchwood. Many people were killed outright and others received horrible wounds. There were 1,066 people on board. The ‘Britannic’ was going to Mudros (the port of Lemnos) to take on sick and wounded for whom she was fitted up to take 3,000 . She was 900 feet in length with a gross tonnage of 48,158. She was the world’s largest British built vessel at the time costing one and a half million pounds sterling. She was launched just before the start of the First World War after being redesigned after the ‘Titanic’ sank and was laid up at her builders in Belfast for many months before being put to use as a hospital ship in 1915. Alfred was in Malta from the 30th November until 14th December when he was posted home. He was discharged as no longer physically fit for active service on 28th March 1917 due to mitral regurgitation having served 2 years and 77 days. His military character was described as honest, sober, reliable, and trustworthy and trained in first aid and ambulance service. His medical records says he had rheumatism in the Spring of 1914 and doctors said his heart had been affected, he had never been well since and had breathlessness and pains in the chest. After his discharge he worked at J.T. & J.Taylor’s as a wagon driver. In 1918 he married Florence Annie Dawson near Stamford, Lincolnshire and they lived at Ailsa Dell, Benny Parr Wood, and Batley. Alfred died on 7th January 1919, at home, and was interred at Batley Cemetery (F 283) on Saturday 11th January at 2 o’clock. He was given full military honours. The Rev. W. Molineux officiated, the coffin was draped with a Union Jack, and a guard of honour was formed by wounded soldiers. Amongst those present at the funeral were Mr. T. W. Fox (president), Mr. J. Almond (acting superintendent) and members of the local St. John Ambulance Brigade as well as Rechabites from Birstall, and employees from J.T.and J.Taylor Ltd.
Alfred was awarded British War Medal 1914-20, and the Victory Medal. 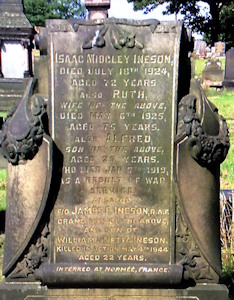 He is remembered with Honour on Batley Parish Church, Batley War Memorial and the family grave at Batley Cemetery. June 28th – Franz Ferdinand assassinated at Sarajevo. July 5th – Kaiser Wilhelm II promised German support for Austria against Serbia. July 28th – Austria declared war on Serbia. August 1st – Germany declared war on Russia. August 3rd – Germany declared war on France and invaded Belgium. Germany had to implement the Schlieffen Plan. August 4th – Britain declared war on Germany. August 23rd – The BEF started its retreat from Mons. August 26th – Russian army defeated at Tannenburg and MasurianLakes. September 6th – Battle of the Marne started. October 18th – First Battle of Ypres. October 29th – Turkey entered the war on Germany’s side. Trenchwarfare started to dominate the Western Front. January 19th – The first Zeppelin raid on Britain took place. February 19th – Britain bombarded Turkish forts in the Dardanelles. April 25th – Allied troops landed in Gallipoli. May 7th – The “Lusitania” was sunk by a German U-boat. May 23rd – Italy declared war on Germany and Austria. August 5th – The Germans captured Warsaw from the Russians. September 25th – Start of the Battle of Loos. December 19th – The Allies started the evacuation of Gallipoli. January 27th – Conscription introduced in Britain. February 21st – Start of the Battle of Verdun. April 29th – British forces surrendered to Turkish forces at Kut in Mesopotamia. May 31st – Battle of Jutland, off Denmark’s North Sea Coast. June 4th – Start of the Brusilov Offensive. July 1st – Start of the Battle of the Somme. August 10th – End of the Brusilov Offensive. September 15th – First use en masse of tanks at the Somme. December 7th – Lloyd George becomes British Prime Minister. February 1st – Germany’s unrestricted submarine warfare campaign started. April 6th – USA declared war on Germany. April 16th – France launched an unsuccessful offensive on the Western Front. July 9th – A series of internal explosions destroyed HMS Vanguard while at anchor in Scapa Flow. July 31st – Start of the Third Battle at Ypres (Passchendaele). October 24th – Battle of Caporetto – the Italian Army was heavily defeated. November 6th – Britain launched a major offensive on the Western Front. November 20th – British tanks won a victory at Cambrai. December 5th – Armistice between Germany and Russia signed. December 9th – Britain captured Jerusalem from the Turks. March 3rd – The Treaty of Brest-Litovsk was signed between Russia and Germany. March 21st – Germany broke through on the Somme. March 29th – Marshall Foch was appointed Allied Commander on the Western Front. April 9th – Germany started an offensive in Flanders. July 15th – Second Battle of the Marne started. The start of the collapse of the German army. August 8th – The advance of the Allies was successful. September 19th – Turkish forces collapsed at Megiddo. October 4th – Germany asked the Allies for an armistice. October 29th – Germany’s navy mutinied. October 30th – Turkey made peace. November 3rd – Austria made peace. November 9th – Kaiser Wilhelm II abdicated. November 11th -Germany signed an armistice with the Allies – the official date of the end of World War One. January 4th – Peace conference met at Paris. June 21st – The surrendered German naval fleet at Scapa Flow was scuttled. June 28th – The Treaty of Versailles was signed by the Germans.